Holiday Packaging Bundles at 20% OFF! This sale STARTS TODAY November 19th, and runs through November 28th. TWO super-special dates of this sale are November 19th and November 28th, which each have their own 24-HOUR SALES! 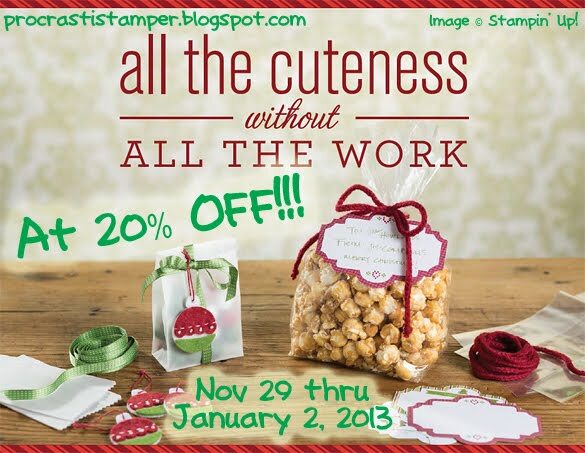 You may take advantage of these sale prices through a Demonstrator Order (if you are a Stampin' Up! demonstrator), a Customer Direct Order, or on a Workshop Order...but the BEST way to ensure you are getting the sale items ordered exactly when you want, at the sale prices you want, is to SHOP THE ONLINE EXTRAVAGANZA IN MY ONLINE STORE! 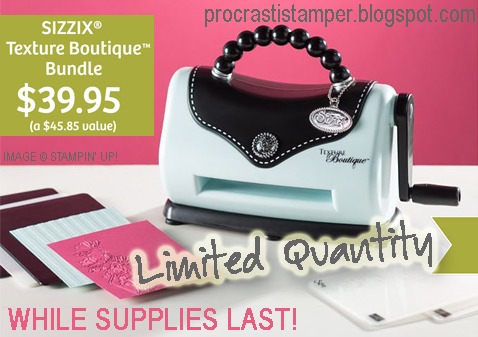 NEWS FLASH: The Petite Pocket Bigz XL Die, and Rhinestone Basic Jewels are LOW STOCK, plus the sale on these items, as well as the 25 & Counting stamp set, Decorative Label Punch, and the 1" Square Punch (all used on this project) ends TOMORROW so go NOW and SHOP THE ONLINE EXTRAVAGANZA IN MY ONLINE STORE! 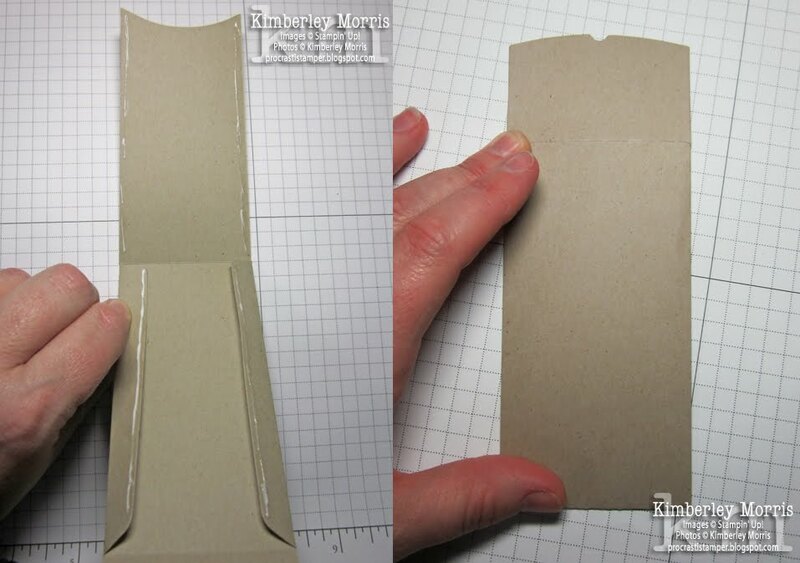 This picture tutorial will show how to assemble 24 Petite Pockets, similar to the one pictured below, for a countdown to Christmas. You can display the pockets however you like, but the flap on each is Velcro® and designed to be closed over a string, to hang in a clothesline fashion. 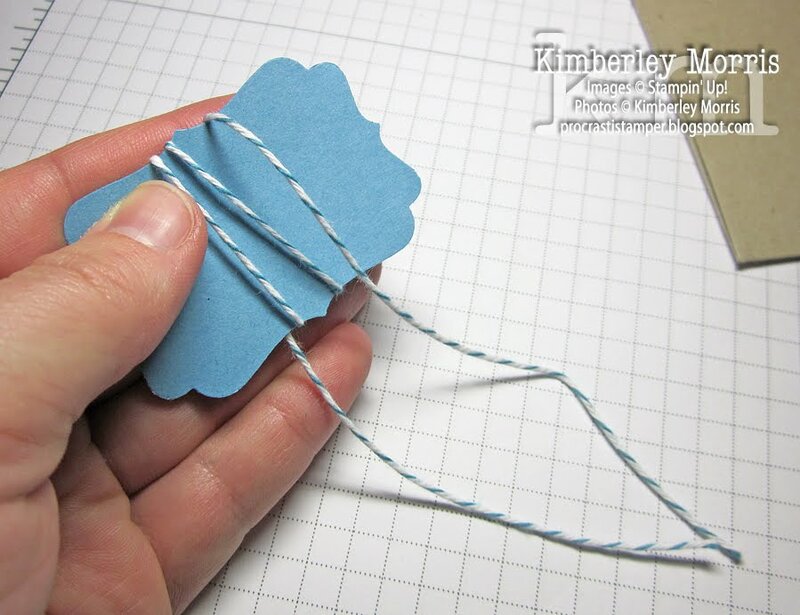 You can put string (or Baker's Twine) across a wall with temporary 3M Command hooks, or grab a large frame at a second-hand store and string a few rows from side to side, for display. Step 2.) 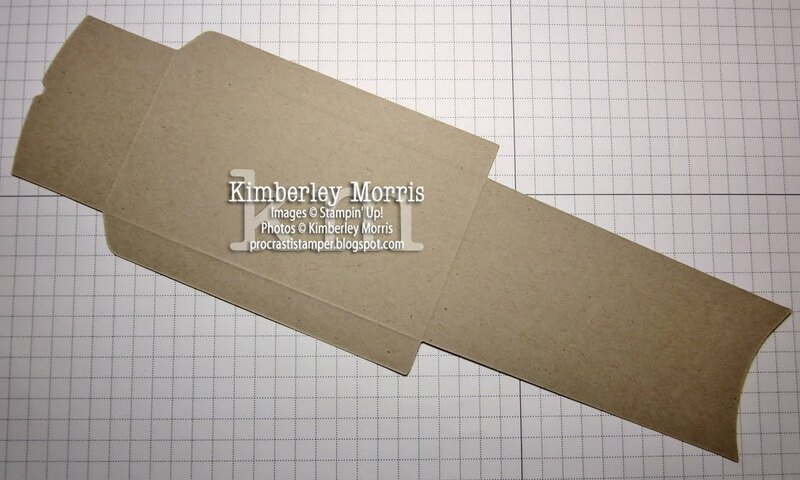 Cut 12 sheets of Crumb Cake card stock in half, so you end up with 24 pieces at 4-1/4"x11". 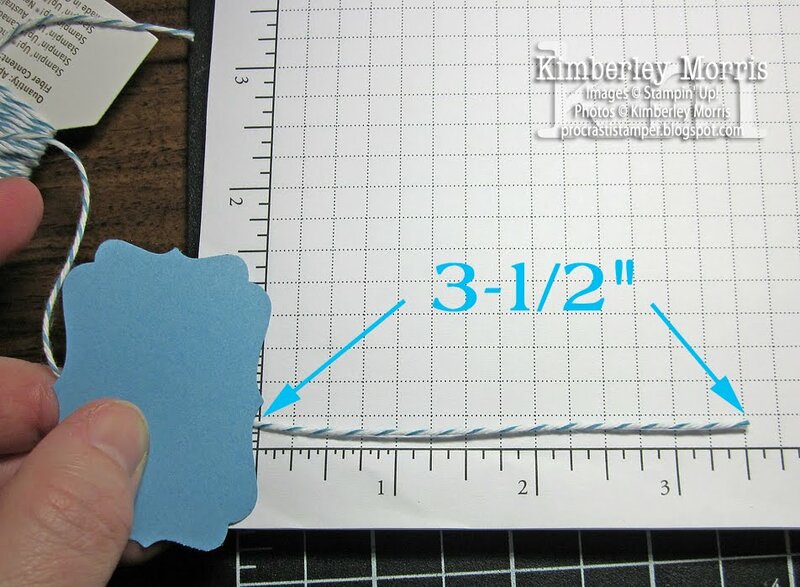 Run each sheet through the Big Shot, using the Petite Pocket Bigz XL Die. 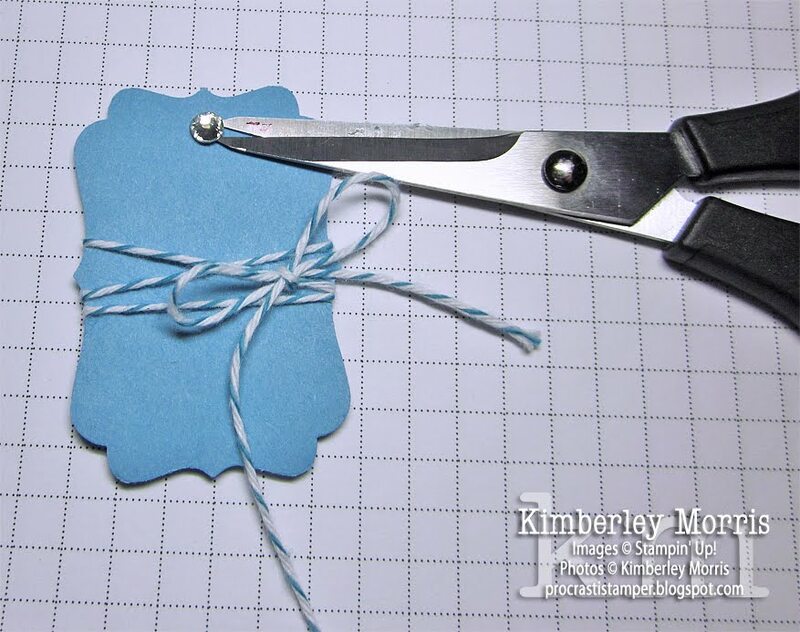 You will need to use Extended Cutting Pads for this, and I highly recommend using the Extended Crease Pad on top instead of one of the Cutting Pads. I find that a card stock shim under my die makes the cuts & scores perfect. 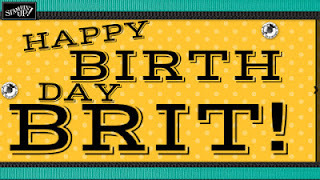 Stampin' Supplies: 25 & Counting stamp set, Petite Pocket Bigz XL Die (use with Big Shot, Extended Cutting Pads, Extended Crease Pad), Decorative Label Punch, 1" Square Punch, Rhinestone Basic Jewels, Crumb Cake card stock, Whisper White card stock, Marina Mist card stock & ink, Gumball Green card stock & ink, Cherry Cobbler card stock & ink, Island Indigo Baker's Twine, Lucky Limeade Baker's Twine, Cherry Cobbler Baker's Twine, Stampin' Dimensionals, Bone Folder, Tombow Multipurpose Glue. 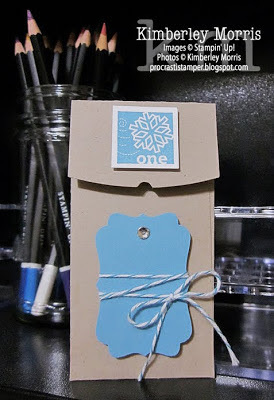 So sorry, I gave you a little tease about a project I am working on (advent envelopes) and told you I'd have the directions for you the next day...and that was on MONDAY! My kids are home for their Thanksgiving break, and we ended up having some last-minute medical appointments, which shifted things a couple of days. Then Thanksgiving was yesterday, and we cooked up a storm :-) And, unfortunately, I woke up a bit under the weather today. BUT--I'm feeling better, and hoping that after we run pick up a couple things from the store (wish us luck with Black Friday traffic), maybe I'll still have the energy to finish my project. It really is a simple project, I just need a little chunk of time to wrap it up. The only other thing you might want for this project, that you can't get from me, are some self-adhesive Velcro® dots. Stay tuned for the rest of the project--and especially if you don't already have a Big Shot, GET YOUR ORDER IN NOW, or you'll kick yourself in the morning (and I don't want you to do that)! I'm still playing catch-up, but wanted to share an ornament I managed to finish...though not before my glue gun gave up with a sparking puff of smoke! (lesson: if your glue gun has spent the last 15 years in the bottom of a drawer, with a stick of glue dried in it, just throw it away...it's not worth a house fire) It's based on the ornament on the cover of Stampin' Up! 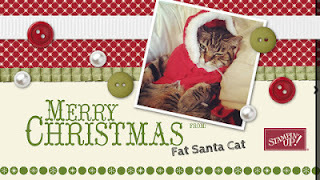 's 2012 Holiday Catalog, and I used the directions from a tutorial Kirsteen Gill posted HERE, changing out some supplies. 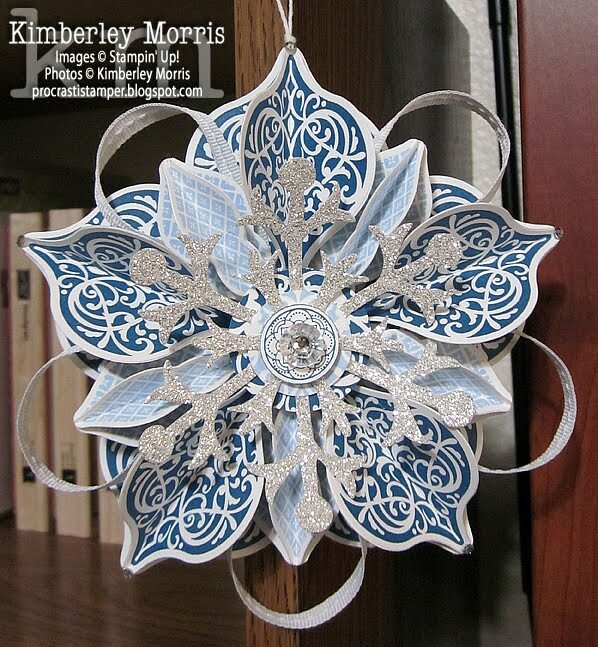 Stampin' Supplies: Ornament Keepsakes stamp set, Holiday Ornaments Framelits dies, Whisper White cardstock, Not Quite Navy ink, Bashful Blue ink, Silver Glimmer Paper, Snow Flurry Bigz die, 2-1/2" Circle Punch (for backing), 1-1/4" Circle Punch, 1" Circle Punch, 3/4" Circle Punch, 1/4" Stitched White Grosgrain Ribbon, White Baker's Twine, Rhinestone Basic Jewels, Vintage Faceted Designer Buttons, Stampin' Dimensionals, Tombow Multi Glue, Silicone Craft Sheet, Glue Gun (non-SU!, preferably not dead or dying...lol). 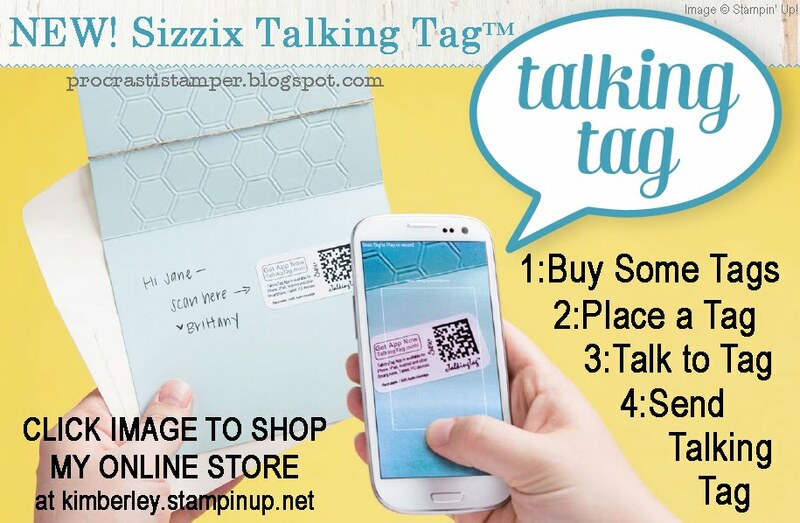 Talking Tag™ NOW Available from Stampin' Up! 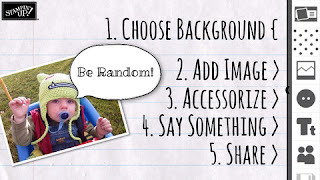 Attach a talking tag to a card, invitation, gift, or anything you want, and share a recorded greeting, sing a little tune, leave voice instructions for a gift, or even create talking treasure hunt clues! To record the message, the sender will need the TalkingTag app on a smartphone or other smart device. The TalkingTag app is available for FREE from talkingtag.mobi, iTunes® or Google Play. You will have the opportunity to listen, re-record, cancel, or confirm your message after you've completed recording it. Each label allows up to 60 seconds of a greeting, song, or product message. You can even copy messages you've already recorded, to new tags, and easily create multiple tags with the same message! To play the message, recipients will need to download the app and scan the code. Messages are saved for two years, so they can listen to it over and over. 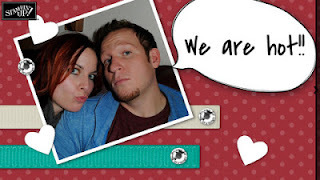 Stampin' Up has created a new app...at this time it is only available on the iPhone, though I believe it also works on the iPad or the iTouch. 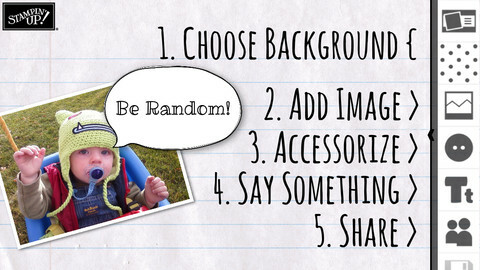 It is FREE and is called Simply Sent™ and works like a micro-version of My Digital Studio. Click the Simply Sent logo image, or the link below, to go to the iTunes app page. Sizzix Texture Boutique Bundle $39.95 - Limited Quantity!!! 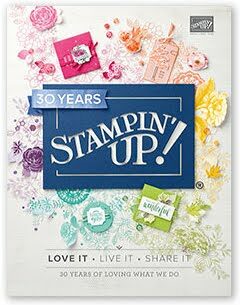 With only 4,000 machines total available from Stampin' Up!, you need to GET YOUR TEXTURE BOUTIQUE BUNDLE NOW for only $39.95, while supplies last! 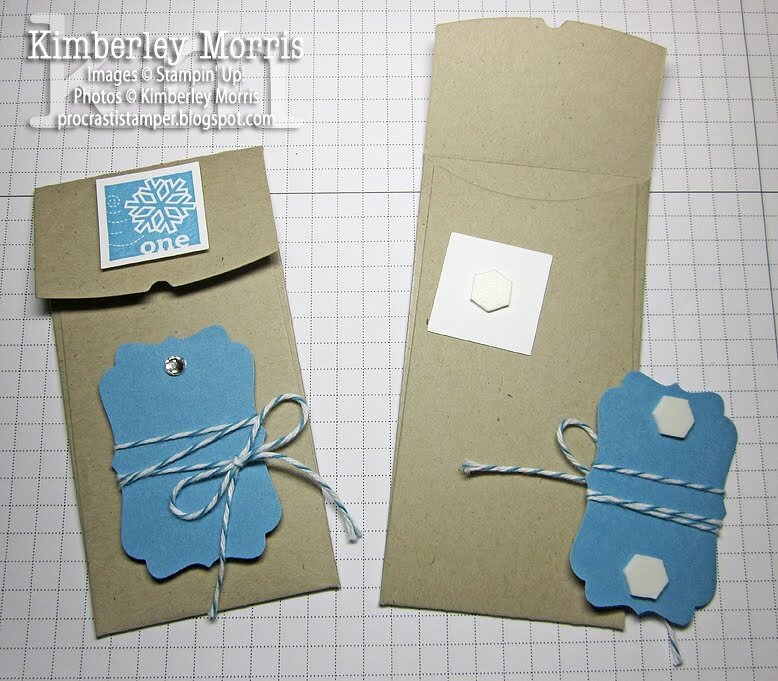 The bundle includes the Texture Boutique embossing machine, 1 pair of standard embossing pads, 1 mylar shim, Flower Garden Textured Impressions embossing folder, and Stripes Textured Impressions embossing folder (both folders are exlusive to Stampin' Up!). 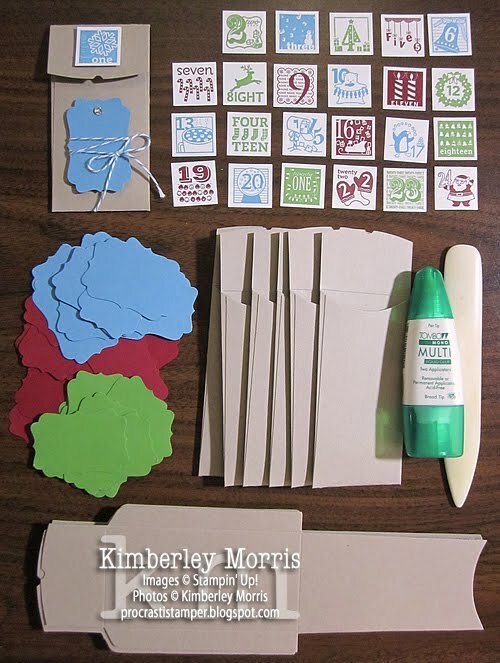 This machine is designed ONLY to emboss, but that is really one of my favorite Sizzix pasttimes :-) It will safely emboss cardstock, paper, metallic foil, or vellum. 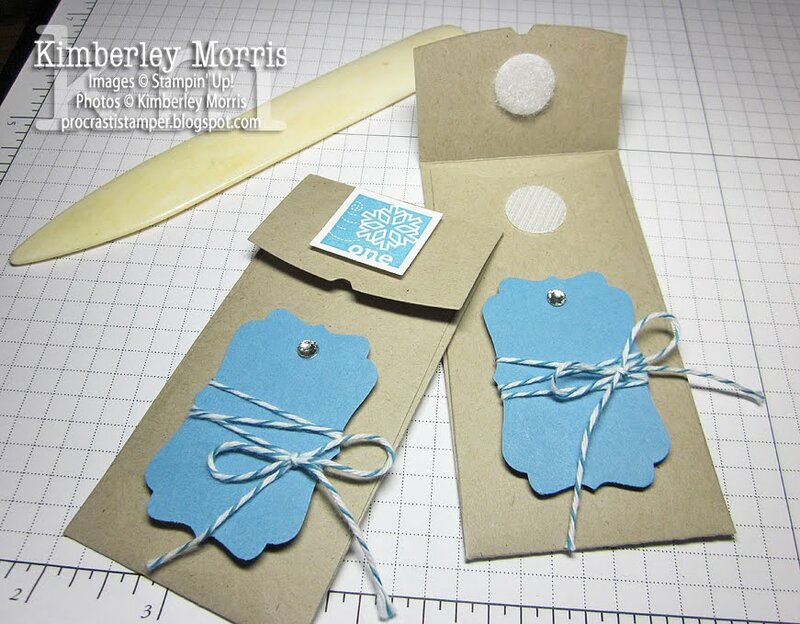 If you prefer, you can also PURCHASE THE TEXTURE BOUTIQUE MACHINE ALONE for only $29.95, which includes 1 pair of standard embossing pads, and 1 mylar shim. 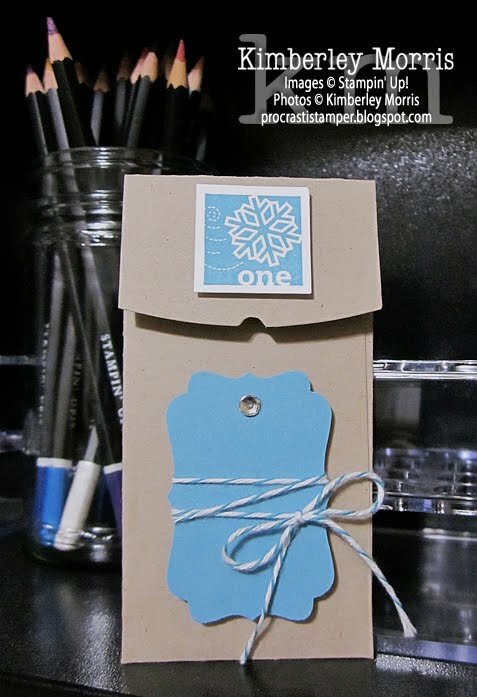 BECOME A DEMONSTRATOR & get a FREE ink pad collection Nov 1-Dec16th, 2012!!! 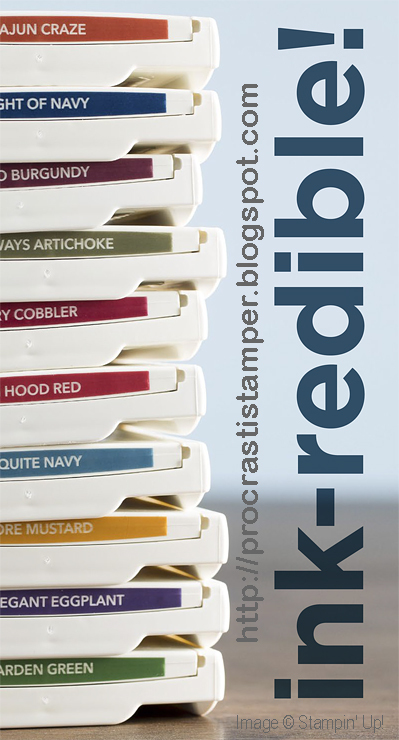 Ink-redible Special - 10 Free Ink Pads! With the first option, you'll need to host a party (workshop) with at least $450 in sales. If you are in or near Colorado Springs, you can have your party at my place, or yours. If you live elsewhere, and would like a virtual demonstration for you or a group, we'll work around what you want to see. Now, you don't have to have an actual physical party, you and your friends could just do some Christmas shopping on the same order together. If you want to do it, just contact me and we WILL make it happen! With the second option, you simply purchase the $99 Starter Kit to Become a Demonstrator. You get to pick $125 worth of product for that $99, PLUS you will get the free collection of (10) ink pads, AND all the other brilliant things that go along with being a demonstrator, such as: 30% off your first qualifying order, at least 20% off every order after that, access to an online demonstrator community FULL of THOUSANDS of ideas and samples, a full color magazine every other month, and Stampin' Up! is always holding promotions for its demonstrators to earn free product and bonuses. 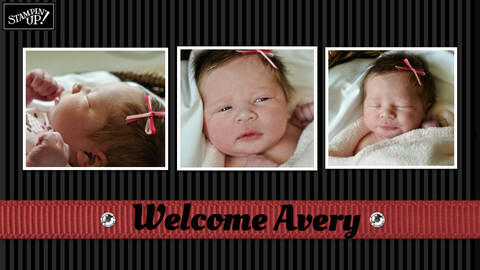 Think it over, and contact me if I can answer any of your questions. Sorry I've been gone a while, I want to let you know where I've been. I don't want to bore you with a long story, so I'll try to keep this concise. This is kind of tedious info, so if you don't want to read, I totally understand--but bear in mind that I learned about my condition to begin with, from someone else having read about it, and relaying that information to me. In 1996, I developed a condition called Trigeminal Neuralgia, and had it for about 8 years. It's basically severe pain in the facial nerve, also called tic douloureux, prosopalgia, Fothergill's disease...or...the suicide disease. It's typically marked by episodes of "lightning strike" jabs of pain, and atypically, can cause pain pretty much 24/7. My pain was atypical, and constant, and quite honestly I'm not sure I would have made it through alive if I hadn't had my kids to live for. I tried everything to alleviate/resolve the pain, from truly zombifying meds, to putting pepper spray on my own face, to pouring lidocaine solution in my sinuses, to getting temporary nerve block injections in my face, to a brain surgery (microvascular decompression). I couldn't sleep, couldn't get much of anything done, had trouble keeping commitments to see anyone or do anything (since I might have to drug myself out of my mind to be able to cope on any given day), it was awful. Nothing helped, until I tried upper cervical chiropractic in January of 2004. After 5 months of visits 3 times per week, I was completely medication and pain free. Fast forward to January 2012, and some dental issues, and the pain came back for a while. But, it was not suicidally severe, and it was not all the time, and it seemed to be triggered directly by one tooth. I had to stay on top of it all the time, but it seemed to be manageable through putting Clove Bud essential oil on and around the troublesome tooth. Finally, in April I was able to get the troublesome tooth removed, along with some necrotic jawbone tissue, and got some bone grafts, and the facial nerve pain completely went away--YAYYYY!!! The next step was a dental implant, basically a screw they put in the bone (after grafts have healed) so they can give you an artificial tooth to replace the awful one. The next day after that implant, I had a strep rash and was having pains in my chest, so I got antibiotics and got through that. Still no facial pain. Then, a couple months later I actually had an abscess, right around the stupid implant! So, apparently, not all the yukkies in my jawbone left with the bad tooth, and apparently the yukkies are not phased by oral antibiotics. However, still no facial pain, so that was good. I had to go back in and have the infected tissue scraped away from the implant (although on a good note, the implant was very well incorporated in the jawbone, just some issues near the top part). Unfortunately, after this "cleanup" surgery, and more antibiotics so I wouldn't get a heart attack, my facial pain started coming back. It wasn't immediate, it was a creeping process. At first, my eyes just felt a little dry and annoying. I couldn't stand to have the car air blowing on me, or to be out in the wind. Then, I got a twitch on the lower right eyelid, which did nothing but get worse, no matter WHAT I tried. Then the pain in the right infraorbital nerve (sandwiched between the bottom of the sinus cavity and the roof of the mouth) got pretty severe and constant, and just kept getting WORSE. This is where my pain was for 8 years, so I was getting a little panicky. I kept telling myself that the infection was all gone, so I should have no pain...but my nerve thought otherwise. It's really hard to explain the pain, but imagine the worst throbbing nerve toothache you've ever had, and the worst and most painful sinus infection, happening at the same time, with 24/7 pain. And imagine that any stupid little thing like a breeze across your face, or your tongue resting on the roof of your mouth, intensifying it. My right eye wouldn't produce any tears, so I had to put in drops, which is another thing that triggers intensifying of the pain. To try to keep from having to use the drops, I'd walk around the house with my right eye scrunched closed, like Popeye. Working on the computer has been near impossible except in little spurts here and there, even with protective glasses--my eyes would just get too strained and dry. Because it worked so well last time, I started going back to the chiropractor 3x per week. I was so desperate for pain relief and sleep that I looked into medical marijuana. I bought all the homeopathics and herbs and supplements I thought might help. Hundreds and hundreds of dollars later and no real relief. I know the chiropractic will work to resolve it again, it will just take time. Then, a couple days ago, I was looking at essential oils to help nerve pain, and happened to read that Coriander helps facilitate certain neurological signals. I had some in the cupboard (for blood sugar issues) and tried it, putting some on my upper gums and the roof of my mouth. IT TASTES SOOOOO NASTY, quite like I would imagine turpentine must taste. But I am SO excited to report that I have not been in any pain since I started using it. If I start feeling the pressure of the beginnings of pain, or even if my eye starts feeling dry, I dab some Coriander essential oil in my mouth again, and it goes away. I'm gonna keep my fingers crossed that this will continue to work. I'll keep up with the supplements I've been taking, and keep going to the chiropractor 3 times per week for a while, but I can't tell you how relieved I am to find something for the pain. And if you know someone who has nerve pain, you might consider suggesting they try rubbing a little Coriander essential oil directly over the area. If they have nerve pain (and maybe even numbness?) and have tried everything else, they will be totally on board with a little oil being rubbed on, believe me. You can add a drop or two of Coriander essential oil to an application of "carrier oil" like olive oil, coconut oil or grapeseed oil...just use unrefined 100% virgin, cold-pressed is best. If the person doesn't want to smell pungent, try it at bedtime, or just try rubbing it on the bottom of the feet. The feet are excellent receptors, and the Coriander smell is not likely to penetrate the socks and shoes. The Coriander essential oil I use is high quality, and I wouldn't recommend any other. You can get it from Be Young Essential Oils. You can go HERE to order it, and if you are not already an existing customer, feel free to enter my number as the Representative ID: 6356. If you, or your family, have any tooth pain, you might also find the Clove Bud essential oil handy to have around. Like Coriander, it also tastes nasty, but that stuff WORKS for tooth pain, until you can get your dental issue handled professionally. 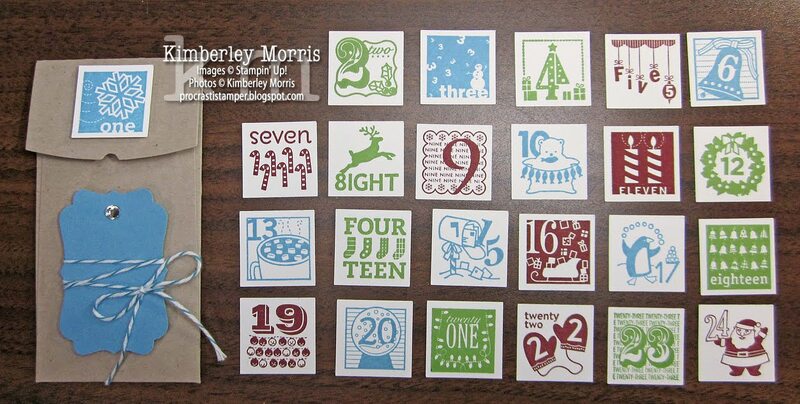 So, stamping-wise, I am just trying to catch up at this point. When I get my head above water, I'll try to pick back up with FREE 30-Day Gratitude Card Challenge printables. I know what I'm thankful for today: BEING PAIN FREE!! !